But this week, when I arrived at DCA three and a half hours early for a flight home to New York, it was… decidedly not magical. One might even call it nightmarish. It was more crowded than I’ve ever seen it. After a long week at work, my nerves just couldn’t handle the masses of people. And so it ended up prompting a travel first: in a split second of extravagance and anxiety, I bought a day pass to the Admirals Club. I’d never been in an airport lounge before. In Tokyo, I briefly rented a (wonderful) day room to recover from my 13-hour flight from New York before connecting to Jakarta, but that’s as close as I’d gotten. And now… I kind of regret my choice. Because now that I’ve seen how the other half travels, I think I might have forever ruined my wide-eyed appreciation of the typical flying experience. 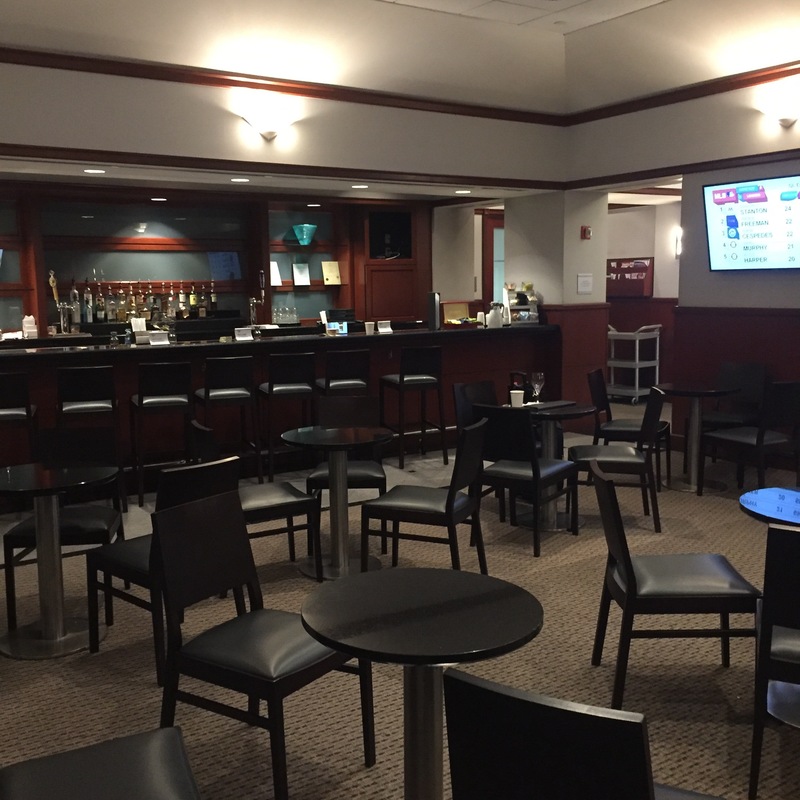 For those familiar with the Admirals Club circuit, the lounge at DCA Terminal C is apparently deeply disappointing. But for a plebe like me, it was heaven. Patrons enter the lounge through a gauntlet of free food—nothing impressive, sort of a continental breakfast situation. But hey. It was free. Or as free as anything I paid $59 to access can be. And the chocolate chip cookies on offer were delicious. And I ate several. You then proceed to a large sitting area, comfortably appointed in cozy chairs and tables in a palette of soothing neutrals. There are outlets galore for your iPhone charger, floor-to-ceiling windows letting in loads of natural light and offering panoramic views of American Airlines gates and the Potomac, and best of all: almost total silence. A total 180° from the chaos downstairs. 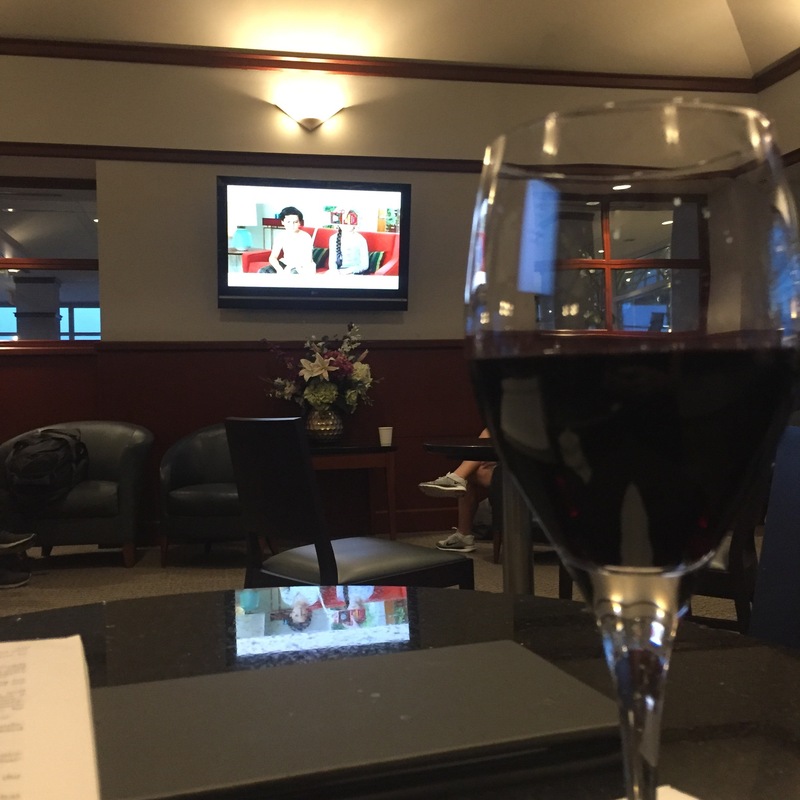 There’s also a conference room, a set of private carrells for business travelers to get work done, and of course a bar, where I ordered a glass (or three) of Cabernet Sauvignon and watched DC-area hometown hero Katie Ledecky dominate at the Olympics. Rubbing elbows with business travelers felt a bit like flying in the Mad Men era, really—the service was excellent, and most patrons were quite well-dressed and seemed to be regulars who were treated like friends or family at the bar. 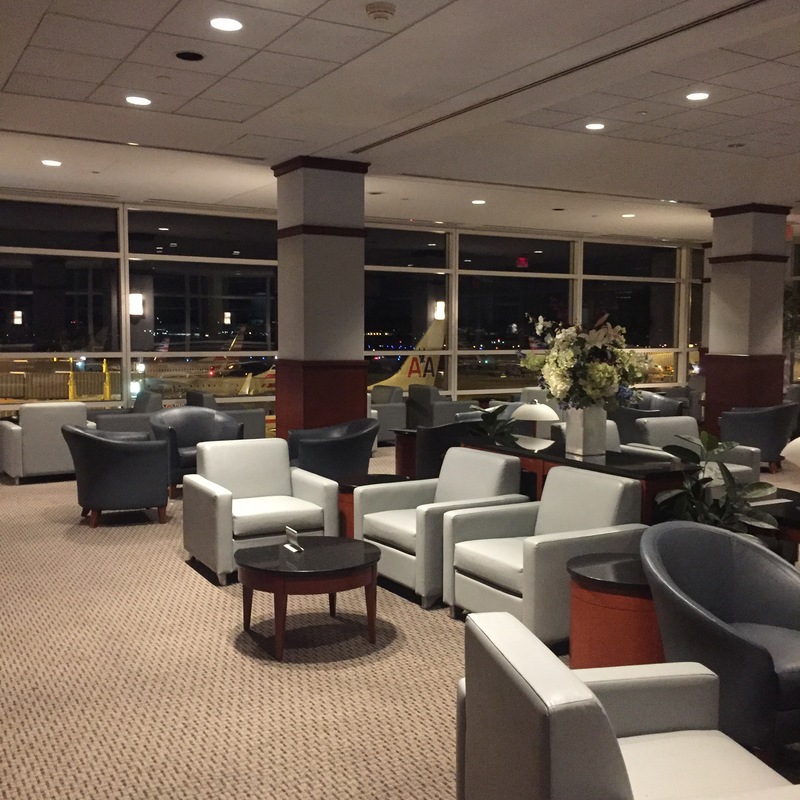 Admittedly, the Terminal C Admirals Club is by no means a perfect space. Even my untrained eye could tell that the sitting area is a bit crowded (though it’s nothing compared to the gates), and that my wine glass was a bit dirty—probably the result of the broken dishwasher that left most patrons drinking from paper cups, and that was apparently causing water to leak onto the TSA checkpoint below. Rich people: they have plumbing problems just like us! Compared to the wildly overcrowded gates downstairs, though, I can comfortably say that it’s paradise. I’m nowhere near the point in my life when I could justify buying an annual Admirals Club membership, but it sure is a nice splurge every once in a while. If you go: A day pass costs $59 and can either be reserved ahead of time or purchased at the club entry on the day of your flight. If you decide to buy an annual membership afterward, you’ll get $50 off the fee.